Heterostyly is a genetic polymorphism characterized by a system of sporophyte auto-incompatibility in which the plant populations show two (distyly) or three (tristyly) floral morphs. This reproductive system is known as a promoter of cross-pollination, assuming similar reproductive success between morphs. For this assumption to take place, the pollinators must respond in a similar manner to attraction floral traits in both morphs, maintaining a symmetric flow of pollen. We hypothesize that floral damage by antagonists should correspond to similarities or differences in attractiveness among floral morphs. We tested this hypothesis in the distylous shrub Bouvardia ternifolia (Rubiaceae). We evaluated the magnitude of the nectar theft, foliar herbivory, and seed predation by assessing individual plants of both floral morphs throughout their flowering period (June-July 2015) under natural conditions. At the end of the flowering season, we quantified fruit and seed production. The intensity of the herbivore and nectar thieves in this distylous population is similar between morphs, as well as the size of their floral displays. The number of seeds and fruits produced was also similar between morphs. Our study showed that selection pressures imposed by antagonists were similar to both floral morphs in the studied population of Bouvardia ternifolia. La heterostilia es un polimorfismo genético caracterizado por un sistema de autoincompatibilidad esporofítica, en donde las poblaciones de plantas presentan dos (diestilia) o tres (triestilia) morfos florales. Este sistema reproductivo es reconocido por promover la fecundación cruzada, y asume un éxito reproductivo similar entre morfos. Para que este supuesto se cumpla los polinizadores deben responder de forma similar ante los rasgos florales de atracción para mantener un flujo simétrico de polen entre los morfos florales. Bajo este escenario, hipotetizamos que, si los morfos difieren o no en atracción, el daño por antagonistas debería corresponder a estas similitudes o diferencias entre morfos en atractividad. Pusimos a prueba esta predicción en el arbusto diestílico Bouvardia ternifolia (Rubiaceae). A través del seguimiento de plantas individuales de ambos morfos florales a lo largo de su periodo de floración (junio-julio 2015) y bajo condiciones naturales, evaluamos la magnitud del robo de néctar, la herbivoría foliar, y la depredación de semillas. Al final de la temporada de floración, cuantificamos los frutos y semillas producidos. Asimismo, en estas plantas evaluamos la disponibilidad de flores abiertas a través del estudio para estimar diferencias en el tamaño del despliegue floral entre morfos. Los resultados demostraron que la intensidad de los efectos de los antagonistas es semejante entre morfos, así como el tamaño de su despliegue floral. También el número de semillas y frutos producidos se mantuvo similar entre morfos. Nuestro estudio demostró que las presiones de selección impuestas por antagonistas son similares en ambos morfos florales en la población estudiada de Bouvardia ternifolia. Hermaphroditic plants have both sexual organs, gynoecium and androecium, in the same flower, which optimizes male and female fitness of the plant. However, this causes potential functional conflicts between characteristics that promote the deposition or removal of pollen grains (Barrett 1998, Barrett et al. 2000). As a result, some flowering plants have developed different reproductive strategies to avoid sexual interference and promote cross-fertilization. These strategies include auto-incompatibility and temporal (dichogamy) or spatial (herkogamy) separation of anthers and stigma (Barrett 1998, Barrett et al. 2000, Webb & Lloyd 1986). In plants with herkogamous flowers is possible to find three types of spatial separation of sexual organs, which include (1) approach herkogamy, where the stamens are short so that the anthers are located below the stigma; (2) reverse herkogamy, where the flowers have long stamens that cause the anthers to overpass the height of the stigma; and (3) heterostyly, which is the reciprocal positioning of anthers with styles of either two (distyly) or three (tristyly) floral morphs (Ferrero 2014, Weber et al. 2013). In populations of distylous plants, the floral morph with long styles and short stamens is named “pin” or “long-styled”, whereas the morph with short styles and long stamens is named “thrum” or “short-styled” (Barrett 1990, Beach & Bawa 1980, Kohn & Barrett 1992). If heterostyly is recognized as a mechanism evolved to promote cross pollination (Barrett et al. 2000, Webb & Lloyd 1986), theoretically, the pollinator visitation patterns (and consequently pollen flow patterns) for both morphs must be symmetric to fulfill the functioning of distyly and cross pollination. It has been proposed that if this assumption is not met, then the promotion of gender specialization is possible (Beach & Bawa 1980, Ferrero 2014), in which the efficiency of the pollen flow is favored usually in the thrum morph (male function), and its reception in the pin morph (female function), thus allowing the evolution of dioecy (Lloyd 1979, Beach & Bawa 1980, Ferrero 2014). Furthermore, most distylous plants have morphologically analogous tubular flowers that enclose the sexual structures, which restricts pollination to a particular behavior of a specialized pollinator (Beach & Bawa 1980). We predict that antagonistic organisms such as herbivores, nectar robbers, and seed predators (antagonists) should be attracted to plants irrespective of the floral morph, maintaining a stable system with equally successful floral morphs. Few studies have focused on evaluating how the antagonist interactions can influence the balance of the heterostylous systems, as a result of the differences in the exploitation of the different resources offered by the floral morphs. For example, the functioning of the distylous polymorphism in hummingbird-pollinated Palicourea padifolia (Willd. ex Schult.) C.M.Taylor & Lorence(Rubiaceae) and the responses of pollinators and insect herbivores to the floral and vegetative resources offered by both morphs were investigated (Ornelas et al. 2004b). The performance of each morph along multiple stages of the reproductive cycle, from inflorescence and nectar production to fruit production, was surveyed, and pollinator behavior and nectar standing crops were then observed. Costs associated with such attractiveness were also evaluated in terms of herbivore attack and of plant reproductive fitness (female function) as a function of leaf herbivory. The number of inflorescences, floral buds, open flowers and ripe fruits offered by either floral morph were similar, but short-styled plants almost doubled the number of developing fruits of long-styled plants. Long-styled flowers produced higher nectar volumes and accumulated more nectar over time than short-styled flowers. Measures of nectar standing crop and data on pollinator behavior suggest that hummingbirds respond to this morph-specific scheduling of nectar production. Lastly, long-styled plants suffered a higher herbivore attack and lost more leaf area over time than those with short-styled flowers. Herbivory was negatively correlated with fruit number and fruit mass, and long-styled plants set significantly less fruit mass than short-styled plants. The results suggest that pollinators and herbivores may exert selective pressures on floral and vegetative traits that could also influence gender function (Ornelas et al. 2004b). Likewise, Boege & Domínguez (2008) showed that damage of pre-dispersed seeds in the distylous shrub Erythroxylum havanense (Erythroxylaceae) occurred to a greater extent on the short-styled morph. However, this only occurred in the first flowering season of the two years of the study, due to a lag in flowering occurring during the second season. On Gelsemium sempervirens (Loganiaceae), Leege & Wolfe (2002) showed that damage by folivores is morph specific, in which the pistils of the long-styled flowers were damaged, whereas on short-styled flowers damage occurred on the stamens; this morph-specific damage might affect differently the fitness of both males (thrum) and female (pin) functions. In another distylous system, Toräng et al. (2008) found that the seed predation of pre-dispersed seeds is different between floral morphs of Primula faninosa (Primulaceae), and that seed damage was dependent on the abundance of antagonists over time. The aforementioned studies suggest that the antagonistic organisms may potentially reinforce or constrain sexual or gender specialization on distylous plants through diffused evolution, that is, as a result of the interaction of the plant with multiple antagonistic species. Bouvardia ternifolia (Cav.) Schltdl. (Rubiaceae) is a self-incompatible distylous perennial shrub (1-1.5 m in height), broadly distributed in open and disturbed zones of forested areas from Arizona, United States, and extending all the way to the southeast of Mexico (Faivre 2000). Long-styled flowers (hereafter LS-morph) and short-styled flowers (hereafter SS–morph) last between 4-5 days, and change from a scarlet red color to a rose-magenta by the third day. At La Malinche, Tlaxcala, Mexico, Bouvardia ternifolia flowers from May to August, and its flowers exhibit imperfect reciprocal herkogamy. Despite this, natural pollination levels mediated by hummingbirds promote the formation of around 80-90 seeds per fruit in both morphs, alluding to their similar reproductive success (Lara 2006, Torres et al. 2008). Flowers of this plant commonly host flower mites of the Tropicoseius (Ascidae) genus, which are important nectar thieves (Salinas-Esquivel 2007). In addition, leaves are commonly consumed by insect herbivores, and fruits damaged by seed predators (Salinas-Esquivel et al. 2013). However, levels of natural damage by these antagonists have not been documented throughout the flowering season and differences in the intensity of antagonistic effects between morphs remain unknown. In this study, we estimated the synergistic effects of nectar thieves, foliar herbivory and seed predation in both floral morphs of Bouvardia ternifolia and to quantified fruit and seed production at the end of the fruiting season. Morph-differences in the attractiveness to both mutualistic and antagonistic floral visitors were also assessed to investigate selective pressures on floral and vegetative traits that could also influence gender function in this population of Bouvardia ternifolia. Study area. This study was carried out during the flowering season of Bouvardia ternifolia (June-August 2015) at La Malinche National Park (19º 14’ N, 98º 58’ W, at 2,900 m above sea level), a protected natural area located between the states of Tlaxcala and Puebla, Mexico. Average annual precipitation in this area is 800 mm, and the predominant vegetation is pine-oak and fir forests, grasslands, and patches of secondary vegetation (Lara 2006). Fieldwork was carried out within 15 hectares of flowering patches of this species, in which of LS-morph and SS-morph individuals ratio is 1.03:0.89 (Palacios-Zúñiga 2015). Larcenists. Floral larceny is a phenomenon which includes animal behaviors where floral rewards are obtained without pollination and, in some cases, damaging the flowers (Inouye 1980). Larcenists are classified as “nectar robbers” (who pierce flowers to extract nectar rather than legitimately entering them), and “thieves” (who enter flowers as pollinators do but transfer little or no pollen, usually due to a mismatch with the flower morphology). Robbers can be subdivided into primary nectar robbers (who make the holes and then extract the nectar) and secondary robbers (who obtain nectar by using holes made by primary robbers) (Inouye 1983). We follow this terminology to estimate floral larceny in Bouvardia ternifolia. For that, plants of both morphs were chosen at random and marked within the study area (N = 55 plants; 24 SS and 31 LS). These plants were subsequently assigned to one of the following treatments: (1) Exclusion of thieves (flower mites and thrips) and hummingbirds using mesh bags with a light opening of 0.8 mm and tanglefoot applied at the pedicel of each floral bud ready to open (N = 80 flowers from 17 LS plants; and 83 flowers from 15 SS plants); (2) hummingbirds exclusion, by using mesh bags, with a sufficiently broad light opening mesh (2.3 mm) that allowed entry of flower mites and thrips (N = 67 flowers from 14 LS plants; and 52 flowers from 9 SS plants). Within both treatments we harvested and measured the amount of nectar (volume and sugar concentration) accumulated during three days from each of the randomly selected flowers using 5 µL graduated micropipettes and a portable refractometer (ATAGO, Master Refractometer 50 H, 0–50 concentration range, BRIX scale). The amount of sugar produced was expressed in milligrams after Kearns & Inouye (1993). Floral display. To assess morph-differences in the attractiveness to antagonistic floral visitors, ≈ 5 plants per morph were randomly chosen and marked each week throughout the duration of the study (N = 69 plants; 35 SS and 34 LS). In these plants, we counted the total number of open flowers (floral display) and the number of flowers perforated by primary nectar robbers, recording the number of nectar thieves present. We estimated the percentage of flowers occupied by organisms based on the total number of flowers present in each plant. Insects were collected and stored in 5 ml of 70 % alcohol for their subsequent identification. Leaf herbivore damage. At the beginning (early June) and at the end of the flowering season (late July), ten randomly selected ripe leaves were collected from each plant per morph, to evaluate the foliar area consumed by herbivores (N = 30 plants/morph, and 600 leaves/morph). Each leaf was photographed and images were processed using ImageJ® 1.50b software. Using a reference scale of 1 cm, the total foliar area and consumed area (mm2) were estimated. Consumed area was converted into percentages to compare damage levels among morphs and across the flowering season. Herbivores observed feeding on plants were collected during field samplings for their subsequent identification. Seed predation. In order to determine the potential effect that seed predators have on Bouvardia ternifolia, 20 different plants per morph were randomly chosen at the end of the flowering season (July-August), in which the total number of fruits (n = 3,837), undamaged fruits (n = 3,680 fruits), and perforated fruits (n = 157) were recorded for each plant. In addition, for each plant 10 undamaged fruits and 10 perforated fruits were collected to quantify seed production. If seed predators were found inside the fruits they were collected for their subsequent identification. Statistical analyses. To assess morph-differences in nectar among the different treatments (with and without exclusion), a generalized linear mixed model (GLMM) was performed with a Poisson error and a log link function as implemented in the lme function from the nlme package of R (Pinheiro et al. 2017, R Development Core Team 2017). The full GLMMs included exclusion treatment as fixed effects and volume and sugar concentration of nectar as response variables. In two models, plant identity was included as a random effect and excluded in subsequent models. The full models were simplified using Akaike Information Criterion (AIC) to select the final models (Akaike 1981). To assess morph-differences in foliar area consumed over time GLMMs with a Poisson error and a log link function in R were used. Two separate full GLMMs (with and without plant identity as random factor) included the factors floral morph and time of flowering season, and the foliar area consumed treated as response variable. Models were simplified as explained above. Similarly, to assess morph-differences in seed production between undamaged and perforated fruits, GLMM with a Poisson error and a log link function was constructed in R. The full GLMM included floral morph as fixed effects and number of seed as response variables. Plant identity was included as a random effect and the full model was simplified using Akaike Information Criterion (AIC). GLM univariate analyses with a Poisson error and a log link function were carried out to analyze morph differences (as fixed factors) in the size of the floral and fruit displays and in the quantity of damaged fruits (as response variables). Finally, a Mann-Whitney-Wilcoxon non-parametric U test was used to evaluate differences between the percentage of flowers perforated by primary nectar robbers, with the presence of nectar thieves (thrips and mites) in both floral morphs. Floral larceny. We identified two types of larcenists on flowers of Bouvardia ternifolia: (1) “nectar thieves” such as hummingbird flower mites (Ascidae: Tropicoseius) and thrips (Thysanoptera: Thripidae), and (2) “primary nectar robbers”, particularly bumblebees (Apidae: Bombini: Bombus). The GLMM analysis showed that flowers of both morphs not excluded from nectar robbers accumulated more nectar than those excluded from nectar robbers (F1, 262 = 20.1625, P < 0.0001). The inclusion of plant identity as a random effect resulted in the most parsimonious model (AIC = 673.57 for the model with plant identity as a random effect, AIC = 677.58 for the model excluding plant identity as a random effect, P < 0.0001). Regardless of treatment, LS flowers had 18.81 % more nectar than SS plants (Table 1). Table 1 Means (±SE) of nectar volume, amount of sugar, total flowers, and the percentages of flowers with antagonists, leaf area consumed, leaves with herbivory, damaged fruits, and fruit and seed set for LS and SS morphs of Bouvardia ternifolia. Numbers with different letters are significantly different after comparisons at P = 0.05 using the adjustment Tukey method. Overall, both floral morphs respond to floral larceny by overcompensating the volume and concentration of nectar. Flowers from both morphs exposed to floral larceny overcompensated nectar volume by 26.70 % (F1, 262 = 7.01, P = 0.009, Figure 1a). In addition, nectar in these flowers had 29.55 % greater concentration of sugars (F1,262 = 23.01, P = 0.0001, Figure 1b, Table 1) in both floral morphs (F1,262 = 8.71, P = 0.003), and the floral morph × exclusion treatment interaction was not significant (F1,262 = 0.01, P = 0.9322). Again, for sugar concentration in the nectar the most informative model included plant identity as a random effect (AIC = 483.29 for the model with plant identity as a random effect, AIC = 492.59 for the model excluding plant identity as a random effect, P < 0.0001). 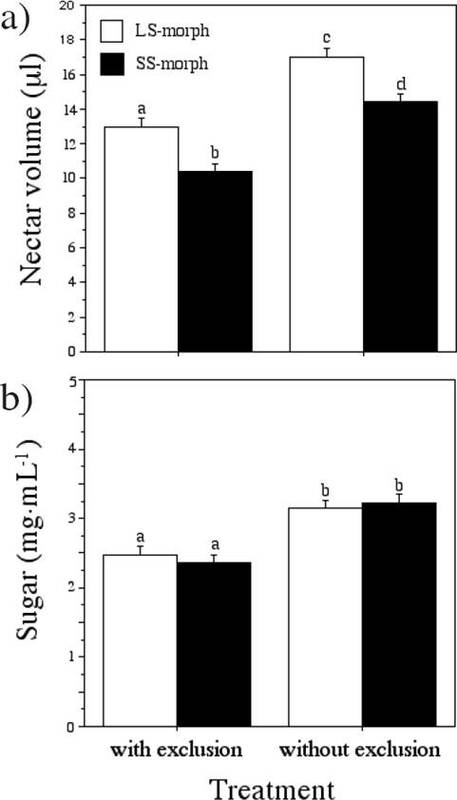 Figure 1 a) Nectar volume and b) sugar concentration (mean ± SE) measured in Bouvardia ternifolia plants with and without exclusion of larcenists. Data with the same superscript letters are not significantly different between groups. Floral display and floral larceny. The GLM univariate analysis showed that the size of the floral display was similar between floral morphs throughout the study period (F1,67 = 0.4721, P = 0.4944; 34 LS plants, 1,492 flowers and 35 SS plants, 1,377 flowers, Table 1), suggesting that this factor does not affect (positively or negatively) the presence of antagonists in either morph. Additionally, no significant differences were found between morphs regarding the number of flowers with perforations by the nectar robbers (Mann-Whitney-Wilcoxon U tests; U = 455.5, Z = -1.692, P = 0.091, nor on flowers with the presence of thrips (U = 460.5, Z = -1.645, P = 0.100) and mites (U = 488.0, Z = -1.303, P = 0.193, Table 1). Herbivory. The main herbivores identified on leaves of Bouvardia ternifolia were leaf beetles (Coleoptera: Chrysomelidae). Results of the GLMM on foliar consumption showed that there were no significant differences in leaf area consumed between the floral morphs (F1,1138 = 0.1797, P = 0.6717), between the beginning and end of the season (F1,1138 = 3.5367, P = 0.0650), and the floral morph × time of flowering season interaction was not significant (F1,1138 = 0.5191, P = 0.4713). The best model included plant identity as a random effect (AIC = 278.46 for the model with plant identity as a random effect, AIC = 282.47 for the model excluding plant identity as a random effect, P < 0.0001). Average percentage of leaf damage was 2.9 % (Table 1). The quantified herbivory levels were low throughout the flowering season, and thus 34.5 % of the samples taken (n = 600 leaves/morph) damaged by foliar consumption. Seed predation. Even though it was not possible to identify the organisms responsible for the consumption of seeds, it was possible to find remains within the perforated fruits. However, these were not sufficiently preserved for their reliable identification. 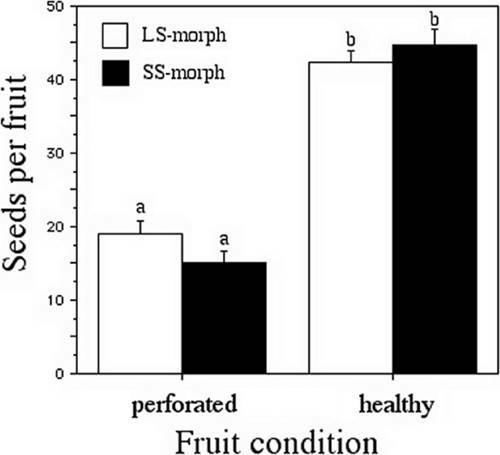 No significant differences were found in the total number of fruits produced between morphs (F1,38 = 3.0969, P = 0.7844) (x = 95.9250 fruits/plant, Table 1), nor on the quantity of perforated fruits per morph (F1,38 = 0.3122, P = 0.5763). The impact of the perforation of fruits on the study population of Bouvardia ternifolia was not high (x = 3.925 damaged fruits/plant). Both morphs had the same number of seeds/fruit (F1, 203 = 0.0434, P = 0.8353), but we found a significant reduction in the number of seeds between perforated and non-perforated fruits (F1,203 = 227.8033, P < 0.0001; Figure 2, Table 1), irrespective of floral morph (floral morph × condition of the fruit interaction: F1, 203 = 3.6137, P = 0.0687). Again, the best model included plant identity as a random factor (AIC = 1,697.04 for a model including plant identity as a random effect, AIC = 1,705.20 for a model excluding plant identity as a random effect, P < 0.0001). Figure 2 Number of seeds (mean ± SE) produced in healthy fruits and perforated fruits by seed predators on plants of both morphs. Different letters indicate significant differences between groups. Data with the same superscript letters are not significantly different between groups. Our study documents that the intensity of antagonistic effects is similar between floral morphs of distylous Bouvardia ternifolia. In addition, we report that the effects of nectar larceny in the volume and sugar concentration of accumulated nectar, leaf damage by herbivore and seed predation were maintained throughout the flowering season. These cumulative effects might cause the number of fruits and seeds being also similar between morphs. Below, we discuss these findings in relation to the putative selection pressures exercised by the visiting antagonists and mutualists (pollinators) and their relationships with the evolutionary stability of the heterostylous reproductive systems. It is known that in different distylous plant species some characteristics of the floral morphs related to the attractiveness towards the pollinators, such as the floral display and reward production, are not equal (e.g., Contreras & Ornelas 1999, Barrett 1990, Faivre 2000, Salinas-Esquivel et al. 2013, Valois-Cuesta et al. 2011). Likewise, it has been suggested that these differences could promote an asymmetrical pollen flow between floral morphs due to a differential attraction of pollinators (Valois-Cuesta et al. 2011, 2012). In addition, the attraction of the antagonists species can also be different between morphs (Ornelas et al. 2004b, Irwin & Adler 2006). For example, in Ipomopsis aggregata (Polemoniaceae) the hummingbirds have shown a greater preference to flowers with wider corollas and more intense red color flowers (Campbell et al. 1997, Campbell 2009), suggesting a hummingbird preference toward particular floral characteristics. In the Gelsemium sempervirens (Gelsemiaceae) distylous species, the characteristics associated with the attractiveness towards pollinators are linked to the defense characteristics, and these are expressed differently between morphs. In this species, it has been shown that the thrum morph has greater concentrations of defensive substances against herbivores than the LS-morph, and these are negatively correlated with sugar quantity available in nectar of its flowers. Therefore, the thrum flowers receive twice fewer pollen grains than the LS flowers as a consequence of receiving a lower rate of pollinator visitation (Irwin & Adler 2006). The aforementioned studies indicate that the expected symmetrical pollen flow between floral morphs is unstable in various plant reproductive systems. However, in distylous systems an asymmetry in the pollen flow can possibly lead to a sexual conflict between floral morphs that can be triggered into other reproductive systems such as the dioecy (Barrett 1992). Due to cross-pollination being necessary for the reproductive success between floral morphs of the heterostylous systems, these should not differ in attributes that contribute to the attraction or rewarding of not only the floral mutualist visitors but also of those antagonistic floral visitors (Leege & Wolfe 2002), leading to similar reproductive success between floral morphs (but see Ornelas et al. 2004a). Our results support the previously mentioned idea that floral morphs of distylous plant species should not differ in attributes that contribute to the attraction or rewarding of not only the floral mutualistic visitors but also of those antagonistic floral visitors (Leege & Wolfe 2002). The antagonists hosted by the plants of both morphs of Bouvardia ternifolia do not have differential effects. The quantities of accumulated nectar and the foliar area consumed, the presence of floral larceny and the quantity of predated fruits were similar for both floral morphs. Accordingly, the quantity of flowers, fruits, and seeds were similar between floral morphs, suggesting that both floral morphs are equally attractive towards mutualistic pollinators and antagonists. Therefore, these results provide evidence that antagonists equally affect the distylous population of Bouvardia ternifolia in the area of the La Malinche National Park, and that factors affecting pollen flow between floral morphs were symmetrical. Morph similarity in the presence of antagonists could favor the stability of the reproductive system and floral polymorphism in Bouvardia ternifolia. However, the presence of these and the magnitude of their effects could change among populations and fluctuate over time (Irwin & Maloof 2002) and, consequently characteristics related to attractiveness and the preferences of the pollinators could also vary and be modified as well across space and time. Attractiveness can be evaluated by observing asymmetries in the floral display, quantity of nectar produced, pollen transfer, floral larceny, and the number of seed predators and folivores that could reveal possible sexual conflicts between morphs (Contreras & Ornelas 1999). The differential volumes of nectar produced between morphs in Bouvardia ternifolia could be countering a possible asymmetry in rates of pollinator visitation. We found that both floral morphs of Bouvardia ternifolia produce greater volumes of nectar with higher sugar concentration in the presence of nectar robbers. Therefore, the floral morphs could be tolerating in a similar manner the consumption of nectar by these antagonists. The LS and SS-morphs produced 24.85 % and 26.76 % more nectar, respectively, with regard to the exclusion treatment. These results are congruent with findings of previous works on Bouvardia ternifolia, in which plants of both floral morphs exposed to various levels of manual nectar extraction seem to equally compensate the experimentally extracted volumes (Salinas-Esquivel et al. 2013). This phenomenon of compensation (suggested as a tolerance mechanism) in light of the floral larceny effect has also been documented in Ipomopsis aggregata (Irwin et al. 2008). In this work, LS and SS flowers with larcenists excluded accumulated a different volume of nectar. Previous work on Bouvardia ternifolia at the same study site agrees with these results (Torres et al. 2008, Salinas-Esquivel et al. 2013). Likewise, similar results were found on other distylous plant species, such as in Palicourea padifolia (Ornelas et al. 2004a). The differences between floral morphs in the quantity of reward offered can be primarily explained through its differences in floral morphology. For example, the anthers in the LS flowers are less exposed than the ones of the SS flowers, therefore, if pollen load on pollinator’s bodies is differential, the LS flowers would need a greater number of visits and offering more rewards to the visitors to compensate with the morphological difficulties in the removal of its pollen assuming that the number of visits is directly proportional to the quantity of the floral resource (Andersson 1994, Contreras & Ornelas 1999, Torres et al. 2008). Morales-Guzmán et al. (2012) demonstrated that for the range of hummingbirds visiting Bouvardia ternifolia, there are different patterns of pollen deposition in their beaks, which is associated to a differential production of seeds between morphs. It seems that short-billed hummingbird species are more efficient in the transfer of pollen than those with longer bills. The opposite pattern was found for Palicourea padifolia, in which long-billed hummingbird species transferred more pollen grains than did short-billed hummingbirds, and pollen from SS flowers was deposited significantly more on stigmas of LS flowers than on the SS stigmas (Ornelas et al. 2004a). Also, in the distylous plant Palicourea demissa, visitation rate and legitimate pollen deposition increased with the nectar production in both morphs, but levels of legitimate pollination were higher on SS flowers than LS flowers (Valois-Cuesta et al. 2011). These results showed that SS and LS flowers reward floral visitors equally, but frequency and foraging behavior of long-billed pollinators can promote asymmetrical legitimate pollination (Valois-Cuesta et al. 2011, 2012). Many of these morph differences found on the floral characteristics of distylous plants, particularly in Rubiaceae distylous species with tubular corollas, substantiate transitory steps towards dioecism (Beach & Bawa 1980), in which one of the first steps for the change towards another reproductive system is the loss of the female function in plants of the thrum morph and/or the male counterpart of the LS-morph. However, the opposite route may also occur. For example, in Palicourea distylous species (e.g., P. demissa) the pattern is opposite; SS plants seem to change to be more female and LS plants more male (Valois-Cuesta et al. 2011, 2012). Subsequently, morphological and physiological changes occur, such as the lengthening of the corollas and a greater production of nectar, which entails a difference in the preference of the pollinators towards a particular morph. Nevertheless, in a parallel work of Palacios-Zúñiga (2015) did not find morph differences in flower morphology of Bouvardia ternifolia; there were no significant differences in the width (t = -1.412, P = 0.161) and length (t = -0.451, P = 0.653) of the corollas of both floral morphs. It was also found that the value of reciprocal herkogamy falls within those provided by Niessen et al. (1990), in which the value for reciprocal herkogamy was -0.304 for style of the LS-morph against the anther of the SS-morph, whereas the value for style of the SS-morph against the LS-morph anther was -0.309. Furthermore, plant counting was carried out on three plots of 500 m2 within the study area in order whether the morph ratio does not deviate from the expected 1:1 morph ratio expected for distylous populations. Furthermore, 7-h of observation was carried out for hummingbird visitation on plants of both floral morphs (N = 62). The hummingbirds visited a total of 569 flowers, 245 corresponded to the LS-morph and 317 to the SS-morph, and these differences in the number of visits were not significantly different (F = 0.418, P = 0.741). In conclusion, we suggest that selection pressures imposed by antagonists are similar to both floral morphs in the population of Bouvardia ternifolia at La Malinche National Park. We have shown that floral morphs of distylous plant species should not differ in attributes that contribute to the attraction or rewarding of not only the floral mutualistic visitors but also of those antagonistic floral visitors. We thank Jesús Palacios Zúñiga for field assistance, and the staff of the Estación Científica La Malinche for access to their facilities. Two anonymous reviewers provided useful comments on previous versions of the manuscript. This project was supported by the Posgrado en Ciencias Biológicas, UNAM, and a doctoral scholarship granted to Luis Antonio Salinas Esquivel (375845, 290840) from the Consejo Nacional de Ciencia y Tecnología (CONACyT). This work constitutes partial fulfillment of L.A.S.E’s doctorate at the Posgrado en Ciencias Biológicas, UNAM. * Corresponding author: Luis Antonio Salinas-Esquivel, e-mail: luisase666@comunidad.unam.mx. Author contributions. Luis Antonio Salinas Esquivel, Carlos Lara, and María del Coro Arizmendi conceived the ideas, designed methodology, collected the data and led the writing of the manuscript. All authors analysed the data, contributed critically to the drafts and gave final approval for publication.